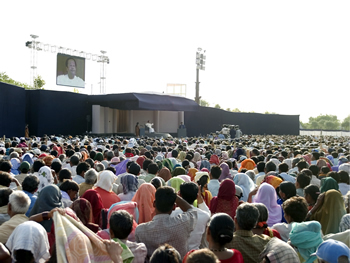 A low stage with a simple chair had been set up on a field. In front of the stage, tens of thousands of people were waiting in silence for the event to begin. On each side of the chair, a podium with a presenter ready to read aloud questions from the public to Maharaji. Backstage, a bank of telephone operators, taking more than 1,000 questions each night and passing them to the presenters on either side of the stage. Throughout the country, more than 635,000 people gathered in 2,100 centers, waiting for the live satellite feed to begin. 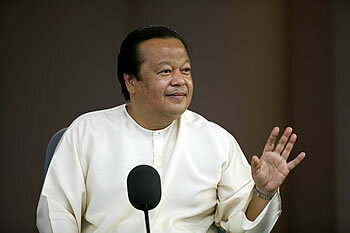 Maharaji walked in and began by saying that to understand what he offers, thirst is needed. If someone is not thirsty, he said, the importance of water is not understood. 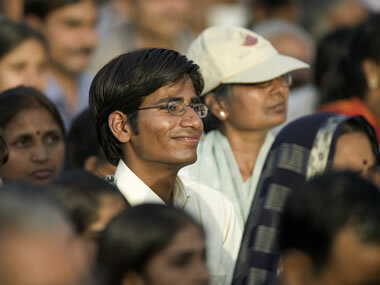 In the same way, without thirst, the importance of Knowledge cannot be understood. He told the story of a person who is looking for water. When he finds nothing coming out of the tap in his home, he looks in bottles and pots, but cannot find water there either. Then he leaves the house to look for water. As he walks out, he sees a fair going on in the street—many people, many lights, many shops. He gets caught up in the fair and ends up forgetting why he came out of his house in the first place. So he goes back home, and only after he is back home does he remember why he had left in the first place. But by now, it is too late. All the shops where it was possible to buy water are closed. Similarly, he said, we have all come from one place and are going back to that place. And once we go back there, we will not be able to come out again. In the short time that we are here, we need to remember what it is that we have come for. We need to remember what it is that we need before we go back. As he answered the first question, which had to do with religion, Maharaji emphasized not only the compatibility of Knowledge and all religions, but also the importance of experience over belief. What matters is experience. Real experience. Fulfillment, he said, can only come from experience. The breath comes in and goes out of us regardless of what we believe. The day this breath goes out, he said, what religion will we follow? Even the fact that we believe is made possible by the breath. To a person asking about the difference between heart and mind, Maharaji answered that mind is what takes us outside and heart is what takes us within. The nature of mind, he said, is to never be fulfilled. The nature of the heart is to want peace. Many voices speak to the mind: television, movies, and many more. But very few voices talk to the heart. This Knowledge, he said, is one thing that is from the heart, not from the mind. Bringing the senses inside? Focusing inside? The heart will understand, the mind will not. Quenching the thirst to be content, he said, is the topic of the heart. To a person asking him what he meant when he asked people not to engage in cheat and deceit, Maharaji answered that the cheat and deceit we need to abandon is the one that we do to ourselves. We know that in our life there is no peace, but we keep pretending that everything is all right. We feel sadness when we see a dead body because we are reminded that this will happen to us, too. Then we realize that we have forgotten the promise we made to ourselves a long time ago to find peace in this life. Ten minutes later, he said, we are back to normal, laughing. We have forgotten the promise. This, he said, is cheat and deceit to our self. To a person asking whether Knowledge removes the difficulties in life, Maharaji answered that, just like an umbrella cannot stop the rain, Knowledge cannot make difficulties go away. An umbrella can prevent us from getting wet. If the turbulence of sadness comes into our life, with Knowledge, we do not have to get sad. Just like Thomas Edison did not invent a mechanism to remove darkness, but rather a device to usher in light, Knowledge does not remove darkness or sadness, but brings happiness. As long as we are alive, he said, difficulties will come and go. This is part of being alive. There is no need to be scared. The only thing to be scared about, is that while we came empty-handed, we should not leave empty-handed. When that happens, he said, an entire life is wasted. Maharaji concluded by emphasizing the importance of experience: Just like a person who is deaf and mute cannot express his awe of what a sweet tastes like, the beauty of Knowledge cannot be described and needs to be experienced for one's self. The promise of Knowledge is that every day we can have an experience that makes our life fulfilled. And to have an experience, he said, we need to have the heart of a child. A child only wants to understand, to be happy. A child catches the beauty, has faith in experience. To understand Knowledge, we need to bring experience back into our life.